It’s spring and rhubarb is in season. I love rhubarb with or on just about anything; last spring I made rhubarb crumb bars which were amazing. 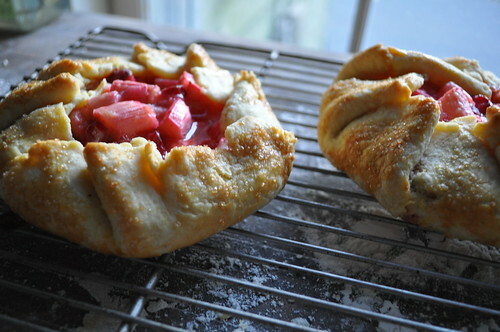 Yesterday afternoon I made individual strawberry rhubarb galettes using Martha Stewart’s cornmeal crust recipe. A galette is similar to a pie but more rustic. They turned out beautifully and super delicious. In hindsight I made them a little too big. I got four out of one crust recipe. I think the proportions would work better for 6. I didn’t really follow a recipe. I’ve made galettes a hundred times so I kinda just threw it all in a bowl. Here’s where I got the idea to make them individually and another galette recipe and how to video on marthastewart.com. Enjoy! I adore rhubarb! Those galettes look amazing! Rhubarb seems to grow like a weed in Yorkshire, where I grew up. Here in LA it is hard to get and I miss those rhubarb pies. any fruit wrapped snugly and baked in dough is heavenly. 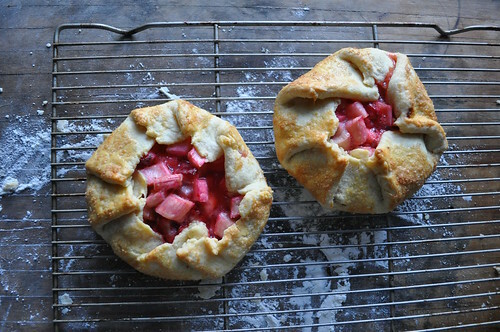 this looks amazing and might inspire me to actually try cooking with rhubarb. thanks. These are beautiful!! I love Rhubarb and I love your food photos. Oh my, these look delicious! Funny, I just bought some rhubarb with no idea in mind of what to do with it. Perfect you should post this. Maybe? After the house I would love to start a family, then maybe have a store, and then maybe a restaurant but only if someone else who is a trained chef would do it with me! Oh and I would to go to grad school for painting…. Oh do those look good, all the pictures of the food you bake makes my mouth water ! Have you ever considered a career in cooking, I know there is no time with the house renovation, maybe after ? 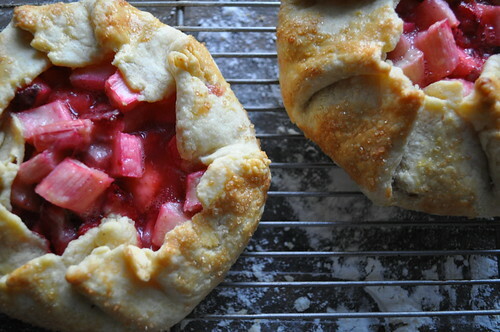 Hmm, will have to try a strawberry rhubarb galette. My grandmother made the best S-W pies. They were just sweet/tart enough to make you drool. Seriously! Yours are even more gorgeous than mine! Brava for not using a recipe. This is absolutely the kind of thing to do by feel. I have some rhubarb at home waiting to fulfill its destiny. I think this might be it! I have always wanted to make a gallette. I have never even tasted one, but they look so delicious.